I found a version of this recipe and I’ve made a few fine-tunings and changes to it over the years. There’s something about the stages of making this casserole now that feels like the cooking version of a hot bath. I feel myself relaxing and unwinding and then it’s a treat to eat. The best thing about it is the flavour. Sausage and rosemary are like the very best old friends who might not see eachother very often but when they do it’s as if no time has passed at all. 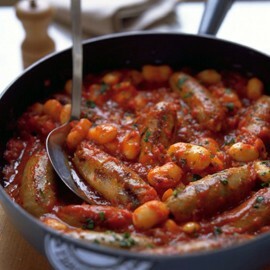 The sausage is cut into chunks and reaps the benefit of a rich tomato sauce. Meanwhile the beans offer a chop and change of texture that is scrummy. There’s no other word for it. You can add chorizo thickly chopped and that just makes it spicy and heavenly – I’ve included where and when to add the chorizo if you want it but don’t feel it isn’t delicious without it. It’s an easy weekday tea and if you like you can leave enough aside for lunch the next day (it’s even tastier the following day – maybe you should make it the day before whenever you make it!). Serve with crusty white bread that leaves a mess all over the kitchen and your lap. For a cheaper option go for the cheapest tinned beans you can find and leave out the tomato puree. Take a large saucepan. Add the oil and shallow fry the sausages with the rosemary, garlic and chilli for around a minute or until you can tell the sausages are well on their way to being cooked. If you’re using chopped chorizo in this recipe then add it here. Add the carrots and the celery and fry for another few minutes until everything is coated in oil and rosemary and is starting to brown and colour. Add the beans and puree and stir well. Add the chopped tomatoes and cover with a lid. Simmer for 20 minutes. The sausages will now be fully cooked. Remove them from the pan and and chop into chunks. You can now return them to the pan along with the tomatoes and simmer on the heat for ten minutes until the sauce thickens. Or you can heat the oven to 180 degrees, transfer the casserole to an ovenproof dish with a lid and bake in the oven for 15-20 minutes. Check to make sure there is enough liquid, you don’t want this to be dry. If it needs half a cup of water add and stir in but you want the sauce fairly thick. For the garlic bread take your crusty loaf. Spread butter on one side. Crush a clove of garlic, smear it along the buttered slice and then scrape off with a knife (making sure you don’t remove the butter!). Bake or grill and serve.